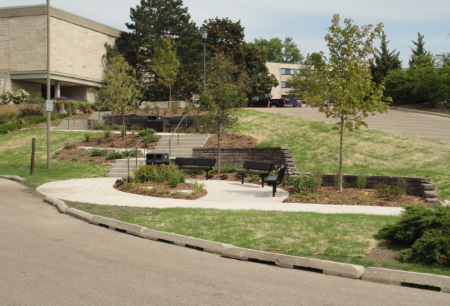 When Carthage College needed new retaining walls installed on their campus, they chose Koch Kuts! With a long reputation for the highest-quality commercial hardscape solutions in SE Wisconsin, the choice was easy. Our professionals we’re able to cost-effectively design and install a concrete wall that fit the special needs of their property; flawlessly bordering sidewalks, stairs, and more. A long-lasting solution, retaining walls are often a popular choice due to their low maintenance needs and incredible ability to control landscape erosion when they’re installed properly. Quality design and the best hardscape materials also add aesthetic appeal. Koch Kuts is the right choice for your hardscape needs, big and small. Finally ready to build the outdoor living space of your dreams? We’ll bring your ideas to life, creating a relaxing oasis right in your backyard. Looking for something bigger – maybe a custom patio for your restaurant or a retaining wall enhancing the landscape around your business? Our professionals will make sure you get exactly what you want with expert planning and exceptional customer service. Get a quote on your hardscape needs, contact Koch Kuts.